Arya Sataka, Stuti Sataka, Paadaravinda Sataka, Kataaksha Sataka and Mandasmitha Sataka are the five sections where Mooka Kavi a dumb turned poet by the grace of Goddess; poured forth his heart in melodious streams of lucid poetry. An Acharya belonging to Sankara Lineage, describes this, in five hundred erotica-religious verses, Goddess Kamakshi’s smiles, her side long glances, her lotus feet and so forth. Listening to these sacred verses is considered to bestow the enormous spiritual powers of learning, capacity of speech and prosperity. 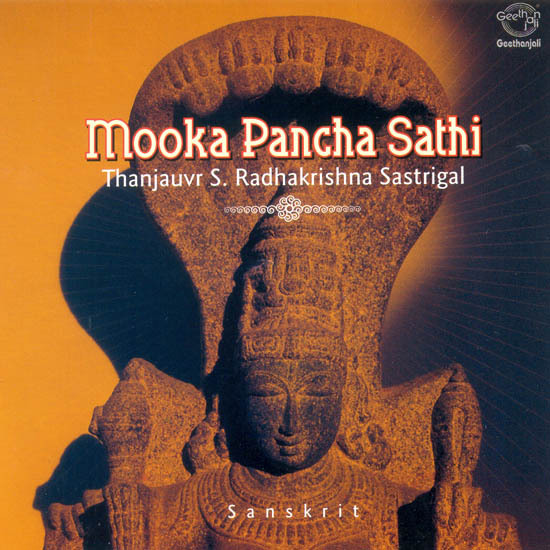 Selected verses are rendered in a spiritual tune by Thanjavur S. Radhakrishna Sastrigal. Super Audio (Madras) Pvt. Ltd. The producers of this compact disc wish all the listeners a prosperous and pleasant life, and to attain the aspired knowledge and powers.